Kidney Organ Allocation in the USA - Upcoming Changes! This is a short video describing the current and new policies regarding deceased donor kidney allocation in the USA. These policies may significantly affect certain groups of patients and physicians must be aware of those in order to best represent their patients. For more details, also check prior blog. A recent renal consult I encountered was a Cantonese gentleman with a classical symptomatic history for Hypokalemic Periodic Paralysis (HPP). He presented with a serum K of 1.4 mmol/l and profound weakness. Initially beginning in his teenage years, he had intermittent attacks of weakness lasting hours and affecting proximal muscle groups. Emergency department admissions invariably revealed low serum K.
High risk Asian and Hispanic population groups, particularly males less than 20 years old. High carbohydrate meals triggering insulin release or B-adrenergic surge from exercise or volume depletion. Thyrotoxicosis: A major subgroup of patients, usually men. The mechanism is thought to involve a combination of up regulation of Na-K-ATPase, loss of function of the inward potassium rectifying channel Kir2.6, and a feed forward effect in certain variants of the sulphonylurea receptor 1, culminating in dramatic intracellular potassium shifts. It is important to note is that rarely the paralytic episodes can predate the thyroid disease by many years. The genetics of hypokalemic periodic paralysis have been discussed previously on Renal Fellow Network. Acute management is relativity straightforward – administration of K, either IV or orally. Case control series demonstrate up to 70% of patients having rebound hyperkalemia of >5mmol/l if KCl doses of over 90mmol/ are administered. Lower doses may potentially be used if concomitant B-blockade is deployed in conjunction. Oral KCl rescue is more suitable for home use. As a rule of thumb, 40 to 60 mmol/l of oral K+ raises plasma potassium concentration by 1.0 to 1.5 mmol/L, and 135 to 160 mmol/l K+ raises plasma potassium by 2.5 to 3.5 mmol/l. Besides avoiding obvious environmental triggers, therapeutic interventions and prophylaxis are more unclear. Patients have normal total body potassium with no chronic GI or renal loss, thus the drop in serum levels is mediated via a transcellular shift. Despite this, prophylactic K supplementation remains a traditional cornerstone of therapy, although one would imagine a normally functioning cortical collecting duct should excrete this quite rapidly, particularly with chronic dosing regimens. The “highest quality” of evidence comes from a Cochrane review of 3 very small studies, the largest examining the utility of dichlorphenamide, a carbonic anhydrase inhibitor, in 34 patients. Self-reported quality of life improved in 15 patients, and attack frequency dropped. This is in line with a more recent study in 2011 which quote a 50% improvement in symptoms in a larger group of patients on dichlorphenamide. This is unusual as the additional HCO3 in the collecting duct should increase intraluminal negative charge, and encourage potassium excretion, as should the volume depletion and increased RAAS activity. Furthermore, volume depletion could theoretically induce increase sympathetic output, worsening K loss. The most plausible explanation I found was a paper from 1975 suggesting the metabolic acidosis induced by the carbonic anhydrase inhibitor buffers the transcellular shift of K+. Despite aldosterone levels being normal during attacks, reports suggest aldosterone antagonists may benefit patients as a second line therapy via their K+ retaining effects, although their action appears to be opposite to that of dichlorphenamide. It is curious these agents with supposed diametric effects on renal K handling both have positive effects on K balance in HPP. The most intuitive treatment is B-blockade, demonstrated in a number of series to be effective, but almost always in those whose HPP occurs in association with thyrotoxicosis. Antiphospholipid syndrome (APS) is an autoimmune hypercoagulable disorder characterized by small-to-large vascular (both arterial and venous) thrombosis with end-organ damages, in presence of circulating antibodies against phospholipid binding proteins. Kidney transplantation in patients with APS is challenging because post-transplant thrombosis, vascular complications and requirement of anticoagulation during peripoperative period. Let’s start with a brief review of recent advances in transplantation in APS. For post-transplant TMA due to recurrent APS nephropathy, Canaud et al. recently explored the use of eculizumab. Eculizumab, a humanized mAb that binds C5, prevents cleavage of C5 into C5a and C5b, thereby preventing generation of the membrane attack complex (MAC). At a molecular level, the pathogenesis of endothelial damage in APS is in part via complement activation; C5b-9 MAC deposition on endothelium, leading to cell lysis and/or activation of other proinflammatory pathways, so the use of eculizumab is reasonable. Three patients, maintained with steroids, CNI and MMF, were treated with eculizumab for posttransplant TMA with robust improvement of allograft functions after several doses, and all three patients were successfully withdrawn from maintenance eculizumab treatment after 3-12 months of initial dose. Interestingly, although biopsy showed improved TMA lesions, C5b-9 depositions were persistent for as long as 3 months as “foot prints”. The authors also noticed that eculizumab treatment did not prevent the chronic vascular lesions seen in 12-month protocol biopsies. Preemptive use of eculizumab in kidney transplant in APS-related ESRD was also attempted in another case series. Three patients, two with CAPS (catastrophic APS), received 1,200 mg of Eculizumab on day 0, 900 mg on POD 1, and weekly thereafter until week 4. After week 5, they received 1200 mg every 2 week. Despite one biopsy proven cellular rejection successfully treated with pulse steroid, graft function and survival was acceptable without recurrence of APS during follow-up of 6 months to 4 years. In the setting of no specific treatment other than systemic anticoagulation, eculizumab seems potentially promising treatment, however, the sufficient treatment length of this drug needs to be optimized, especially due to high cost. Also, there is no description of immunosuppressive regimen either for induction nor maintenance, and it is unclear these patients were on sirolimus or not. In a recent NEJM article, Canaud et al. indicated the beneficial effect of sirolimus in proliferative vascular changes associated with APS and CAPS, which were not reversed by eculizumab in their previous study. 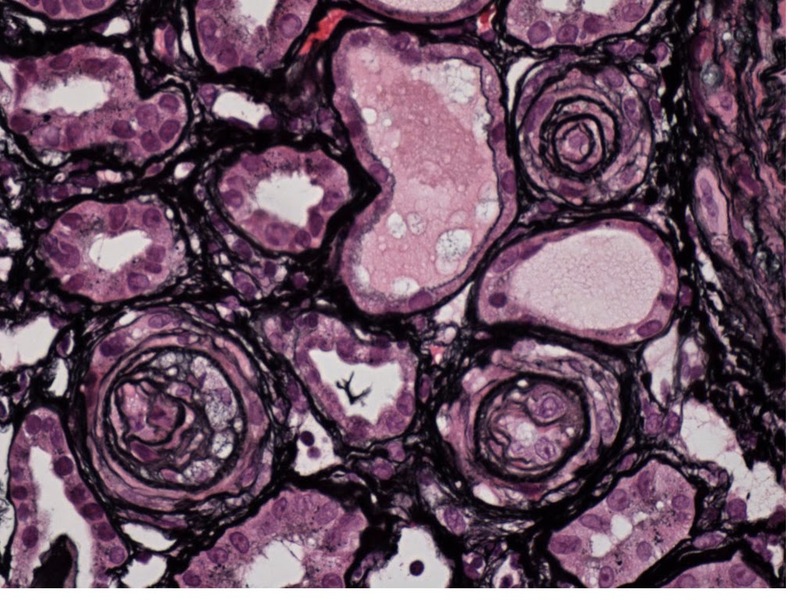 They demonstrated that the chronic vascular changes in APS patients were induced by activation of mTORC via phosphorylation of Akt-S6K pathway, using immunohistochemistry of renal biopsy samples and in vitro signaling studies with HIMEC-1, a human microvascular endothelial cell line, as well as autopsy samples of CAPS. Furthermore, using a cohort of kidney transplant patients with APS (10 treated with steroids+sirolimus+purine inhibitor and 27 with steroids+CNI+purine inhibitor), their nested-case-control study demonstrated that posttransplant allograft functions were better preserved at 144 months post transplant in the sirolimus group compared with CNI group (7 of 10 vs 3 of 27 patients with functioning grafts) and this effect was observed only in patients with APS and not in patients without APS. Other variables including cold ischemia time and immunologic risk profile were comparable between sirolimus and CNI groups. Although this is a relatively small case-controlled study, the use of mTOR inhibitors for the prevention of APS post-transplant seems very promising. The next Nephrology online journal club (#NephJC) will discuss the results of the CORONARY Trial, presented at the late breaking session at the ASN and published this year in JAMA. The trial compared patients undergoing their first coronary artery bypass graft (CABG) surgery using an off- or on-pump technique. The main study published previously revealed no difference with respect to the composite outcome of 30-day mortality, myocardial infarction, stroke or acute kidney injury (AKI) requiring dialysis. The renal function trial was a prespecified substudy involving 2975 (of a total 4752) consecutive patients enrolled in CORONARY with baseline and post-operative serum creatinine data. The renal substudy patients had similar characteristics to the overall CORONARY population. Post-operative AKI was defined as a 50% increase in the serum creatinine concentration within 30 days of surgery (highest creatinine within 30 days was used). Loss of renal function at 1 year = 20% loss in eGFR (using CKD-EPI). Worldwide enrolment with 42% from Asia and the remainder mostly from Europe (21%) and the Americas (<1% were African American). Baseline characteristics of note were a mean age of 68 years, BMI 27, >80% male, almost half were diabetic and a similar number of ‘urgent’ cases between the groups. Almost a quarter had CKD (eGFR <60mls/min) and the mean eGFR was 74-75mls/min in the 2 groups. There were 561 AKI events (median time of 2 days post-op to peak creatinine) with a reduced rate with off-pump (17.5%) V. on-pump (20.8%) surgery (adjusted RR 0.83 [CI 0.72-0.97]; p = 0.01). Mean eGFR at 1 year was 72 mL/min with off-pump and 73 mL/min with on-pump. No significant difference in loss of eGFR at 1 year between off-pump (17.1%) V. on-pump (15.3%) surgery (P = 0.23). Those with CKD derived a greater benefit in reduced AKI with off-pump surgery but eGFR loss at 1 year remained insignificant. Over 200 patients crossed over between the groups (evenly split) and results of the intention to treat were similar to as-treated analysis. 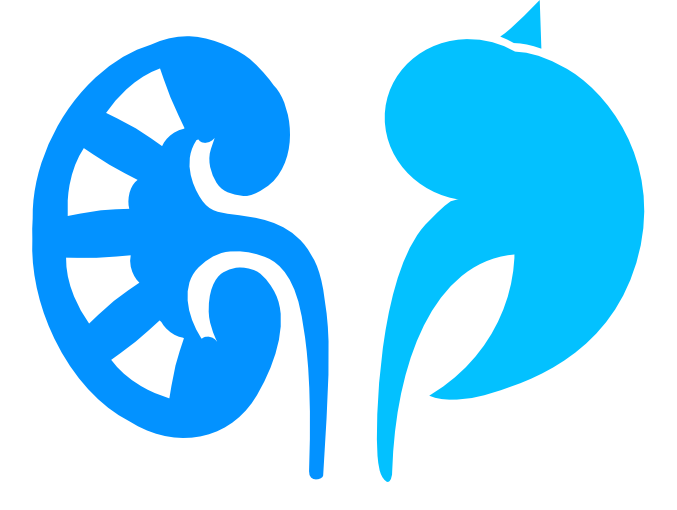 Multiple alternative definitions of AKI & loss of kidney function did not alter the main results. Dialysis requiring AKI has detrimental effects on long-term kidney function. Less severe AKI is more common with major cardiac surgery (only just >1% had AKI requiring dialysis in the original CORONARY trial). It is less clear what effect these more subtle derangements have on long-term function. This study suggests that these ‘mild’ AKI events may not have much longer-term significance, contrary to observational studies [ref, ref]. As pointed out by the authors, this finding has implications for other interventions in mild AKI such as for contrast nephropathy. Does preventing a subtle GFR dip in this scenario have a long-term benefit? The study is limited somewhat by the unique situation studied in the trial (although cardiac surgery provides a very ‘convenient’ insult in which to study AKI). Also, we are relying on serum creatinine and all its limitation to assess kidney function. Moreover, not all eligible patients had creatinine values measured and single measurements and imputed values were often used for the analysis. This study provides good evidence that off-pump CABG decreases the rate of non-severe AKI but that this does not appear to translate into better renal function at 1 year. 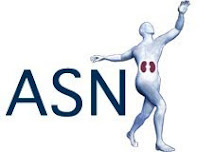 When I first heard the results of this study at the ASN (a somewhat deflating session along with lots of other negative/inconclusive Nephrology studies), I was disappointed with the small magnitude of the AKI decrease with off-pump surgery. I had expected the toxic milieu associated with on-pump surgery (aortic cross clamping, exposure to bypass circuit, changes in blood pulsatility) to be associated with much higher rates of AKI, compared to off-pump. The study also questions my preheld assumption that acute drops in GFR, from mild to severe, had a continuous magnitude of impact on long term renal function. 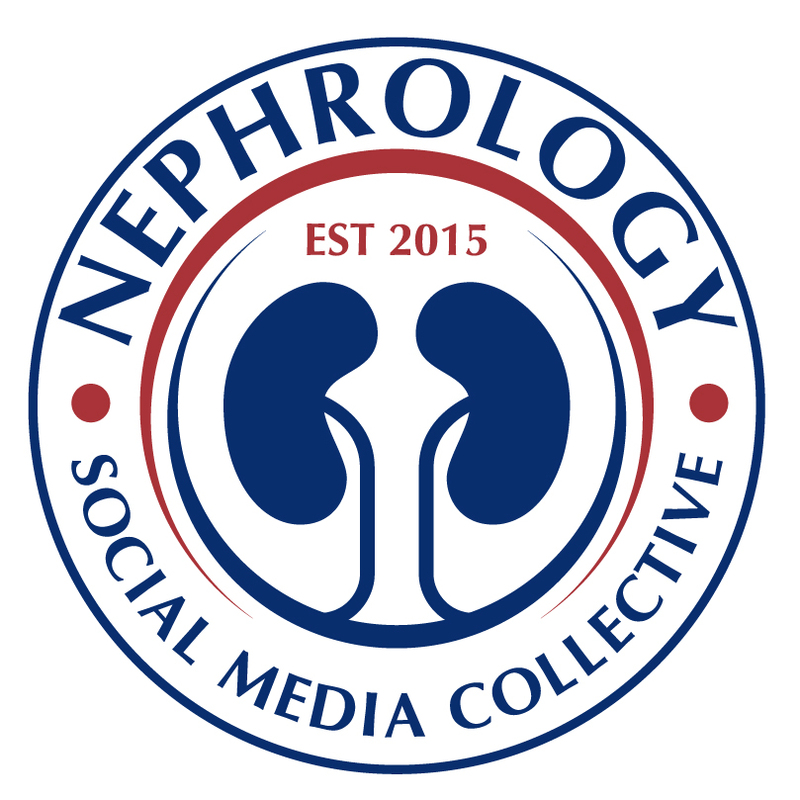 Feel free to get involved by joining the live Twitter chat on Tuesday 26th August at 9pm Eastern using #NephJC. 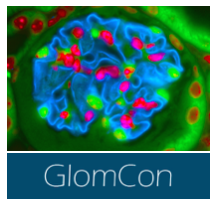 Also, check out www.nephjc.com for more background and past journal clubs. As a renal fellow, I have found myself reaching for spironolactone more and more. It is very helpful when treating the patient with resistant hypertension, but it continues to be under-utilized. Aside from the renal-centric effects of aldosterone, there is evidence that mineralocorticoid receptor activation is responsible for pathogenic remodeling (both structural and electrical) after myocardial infarction. In fact, aldosterone is also produced by the heart, and cardiac expression of the mineralocorticoid receptor is increased in the setting of heart failure and MI. Perhaps aldosterone antagonists can reverse the cardiac remodeling, predisposition to arrhythmia, and risk of cardiovascular death we see in our kidney disease patients? Remember, patients with ESRD do not die from kidney failure per se, but most die from cardiovascular and cerebrovascular disease. We know that spironolactone reduces mortality and hospitalization due to heart failure in patients with reduced LVEF (RALES trial), but we don’t know if these effects carry over to the ESRD population. However, two recent papers caught my eye. One was recently published in JACC, where 309 patients with ESRD were randomized to spironolactone 25mg once daily or a control group. The primary outcome was a composite of death or hospitalization from cardiovascular and cerebrovascular events, and the secondary outcome was death from any cause. At three years, the treatment group had significantly fewer cardiovascular and cerebrovascular events: 9 patients (5.7%) vs 19 (12.5%) in the control group (Adjusted HR 0.379, p = 0.016). There were also fewer deaths: 10 (6.4%) with spironolactone vs 30 (19.7%) in control group (Adjusted HR 0.335, p=0.003). Out of the 157 patients in the spironolactone group who stopped the drug, 7 developed gynecomastia, 9 had breast pain, and 3 patients had significant hyperkalemia (>6.5 meq/L). Of course, this was a small RCT and not blinded or placebo controlled. If these effects are true, this would yield a NNT of 14 to prevent one cardiovascular or cerebrovascular event and a NNH of 52 to cause one episode of hyperkalemia. A similar study published in JASN randomized 158 patients on PD and already on ACE/ARB therapy to 25mg of spironolactone or a control group. After two years of follow up, the rate of change of LVMI was significantly lower at 6, 18, and 24 months in the spironolactone group. In a subgroup analysis of males who started the trial with LVMI ≤ 50 g/m2, the control group had a significant increase in LVMI over time while the spironolactone treated group was unchanged. Likewise, in males who started with LVMI > 50 g/m2, those treated with spironolactone had a significant reduction in LVMI over time compared to the controls. In this trial, serious hyperkalemia (>6.0) occurred infrequently: 2 in spironolactone group and 1 in control. Gynecomastia was more frequent in the spironolactone group (14.1% vs 2.5%), but some of these patients had their doses reduced or were switched to eplerenone. So what does this all mean? It’s exciting to think that mineralocorticoid antagonists may reduce LVH and cardiovascular events in our ESRD population. A larger, placebo controlled trial is needed to confirm these findings since these were small open-label trials. Fortunately this is underway with the ALCHEMIST trial (NCT01848639), which plans to randomize 825 hemodialysis patients to either spironolactone or placebo. In the meantime, it may be best to use spironolactone as an anti-hypertensive agent in a dialysis patient who is low risk for hyperkalemia. For instance, PD patients tend to have have low serum potassium thanks to high clearance. In the PD patients I’ve seen with hypertension and hypokalemia, I have been backing off pure anti-hypertensive agents (like hydralazine) and starting 25mg of spironolactone. These trials suggest that this dose is safe to use in dialysis patients and possibly has some effect in preventing LVH and improving long-term cardiovascular outcomes.